There is a brief moment every summer when the english peas, snap peas and peas shoots are available at the Green City Market in Chicago. This is a simple recipe celebrating these ingredients at their best. Cook peas in a medium saucepan of boiling salted water until bright green, about 1 minute. Using a mesh sieve, transfer to a colander set in a bowl of ice water. When the peas have cooled, lift the colander from the bowl and allow the peas to drain. Cook the snap peas in the same way as the peas. Set aside. Tear open the balls of burrata and place on a large serving platter. Top with the english peas, snap peas and pea shoots. Drizzle olive oil over the salad and sprinkle with sea salt and black pepper. On Sunday, I went on a foraging adventure with Chef Iliana Regan of Elizabeth Restaurant and her friendly crew. The day began with coffee and a breakfast of scrambled eggs, bacon, potatoes, and warm artisanal bread and donuts at the restaurant. After a brief description of our itinerary, I enthusiastically boarded a school bus along with 36 other foragers for the hour and a half long journey to the woods. Upon arrival at our destination, we ventured into the woods in search of mushrooms. Our mushroom expert asked us to collect a selection of all the mushrooms we encountered and to bring them back for identification. The foragers were most excited to search for Hen of the Woods mushrooms which are common in the Midwest in the early fall. Hen of the Woods are frequently found at the base of large oak trees. Within the first five minutes, a beautiful Hen of the Woods was discovered by one of the foragers. A vast array of mushrooms including Hen of the Woods, Chicken of the Woods, and Puffballs were gathered throughout the late morning and early afternoon. Others found young clusters of Ringless Honey mushrooms on oak trees and stumps in the woods. Although I did not find any Hen of the Woods on my foraging adventure, I discovered a few spongy white mushrooms growing in moss. Upon returning to our gathering area for lunch, the mushrooms were identified by our expert as Shrimp of the Woods. Shrimp of the Woods are a delicious, mild flavored wild mushroom. All of the foragers enjoyed the day wandering in the woods. At the end of the afternoon, the picnic tables were covered with a vast selection of foraged mushrooms as well as a deer antler and a small animal skull. Our mushroom expert identified each of the mushrooms; she taught us the names of the foraged mushrooms and whether or not they are edible. At 4 o’clock, we boarded the bus with our bounty and headed back to the city. When I was a child, I hated brussels sprouts. Thankfully, I have grown to enjoy crunchy shaved brussels sprouts in salad as well as crispy seared or roasted brussels sprouts as a side dish. This recipe has the perfect combination of seared brussels sprouts, salty bacon, sweet dates, and sour vinegar; the flavors are reminiscent of traditional Italian sweet and sour agrodolce sauces. I prefer the slightly less sweet version of this recipe made with fewer dates and a touch more vinegar. The proportions of dates and vinegar can be altered to your individual taste. Heat a large frying pan over medium-high heat. Add the bacon and olive oil. Cook the bacon for 10 minutes until it has browned and rendered most of its fat. Remove the bacon from the pan with a slotted spoon to a paper towel lined plate leaving the olive oil and bacon fat behind. Increase the heat from medium-high to high. Add the brussels sprouts to the frying pan with the cut sides down and cook undisturbed for 5 minutes until well seared. When the brussels sprouts have a deep sear and are starting to darken in spots, turn them over and season with salt and pepper. Return the bacon to the pan with the brussels sprouts and add the dates stirring well to combine. Slowly begin to add ¾ cup of stock to the pan. Add the additional ¼ cup of stock, 1 tablespoon at a time, if the pan seems dry. Use the back of a spoon to crush the dates into the stock. When the dates begin to melt and incorporate into the sauce, add the vinegar to taste. Cook for an additional 1-2 minutes until the sauce thickens slightly. Transfer the brussels sprouts to a platter and serve immediately. Roasted Radicchio and Cherry Tomatoes with Mozzarella and Radicchio Salad with Tapenade are two of my favorite ways to serve radicchio. Radicchio, a variety of chicory, has a bitter taste which becomes less extreme with grilling or roasting. Like other bitter leaves, radicchio is especially delicious when its bitterness is balanced by other tastes that are salty, sour, or sweet. Roasting radicchio in the first recipe and pairing it with the natural sweetness of cherry tomatoes and the salty, creaminess of mozzarella tempers the bitter taste. In the salad, the radicchio is enhanced by the slightly sweet vinaigrette made with balsamic and sherry vinegars and fruity olive oil, the Parmesan, and the olive tapenade. Although bitter is arguably the least popular of the basic tastes, it is a taste that should not be missed. Toss the radicchio wedges with 2 tablespoons of the olive oil. Place the radicchio on a sheet pan lined with parchment paper and season with salt and pepper to taste. Roast in the oven, turning once, for 10-15 minutes until slightly wilted and charred. Transfer to a platter. Combine the balsamic vinegar, sherry vinegar, shallots, and salt in a small bowl. Allow to sit for 10-15 minutes. Whisk the remaining 3 tablespoons of olive oil into the vinegar and shallot mixture and add pepper to taste. Drizzle the vinaigrette over the roasted radicchio. Tear the mozzarella and add to the platter with the roasted radicchio. Scatter the roasted tomatoes over the roasted radicchio and mozzarella. Place cherry tomatoes cut side up on a parchment lined baking sheet. Roast for 1 ½ to 2 hours, turning the baking sheet every 30 minutes, until the tomatoes are shriveled, half-dried, and slightly charred on the edges. Thinly slice the radicchio wedges into ¼ inch slices. Fill a salad spinner with water and add ice to chill. Remove the ice from the water and add the sliced radicchio. Allow the radicchio to soak in the water for 15 minutes to remove some of the bitterness. Drain the water and spin the radicchio until dry. Place the radicchio in a large salad bowl. Combine the balsamic vinegar, sherry vinegar, shallots, and salt in a small bowl. Allow to sit for 10-15 minutes. Whisk 3 tablespoons of olive oil into the vinegar and shallot mixture and add pepper to taste. Drizzle the vinaigrette over the radicchio and toss. Add the Parmesan to the salad and toss again. Brush the baguette slices with the remaining tablespoon of olive oil and season with salt and pepper. Grill or broil the slices until slightly browned and toasted. Top each of the baguette slices with 1-2 tablespoons of tapenade. Serve the salad with the baguette slices topped with tapenade. Place olives, red onion, parsley, and tarragon in the bowl of a food processor and pulse several times to finely chop. Place the olive mixture in a small bowl, add the olive oil, and stir to combine. I am a fan of Toro Bravo, a Spanish-style tapas restaurant, in Portland, Oregon. 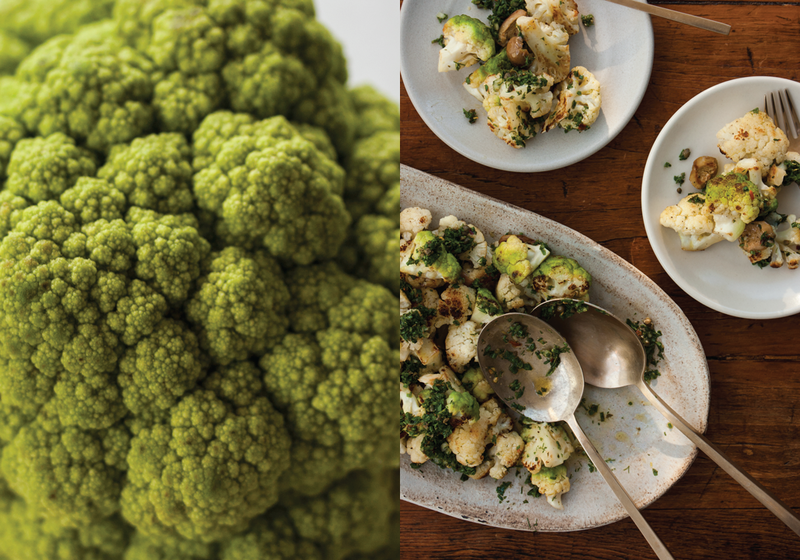 This recipe for Seared Cauliflower with Salsa Verde and Olives adapted from Toro Bravo: Stories. Recipes. No Bull. is a another great reason for me to love cauliflower. I prepared this recipe with white and green cauliflower from the farmers market. Although green cauliflower is similar in flavor to white cauliflower, I love the color contrast it adds to the recipe. Bring 12 cups of water to a boil in a large pot. Add 3-5 tablespoons of kosher salt to the pot and add the cauliflower florets. Allow the water to return to a boil and cook the cauliflower for 1 minute. Strain the cauliflower and place on a sheet pan to cool and dry. Melt the butter and 1 tablespoon of the olive oil in a large frying pan over medium-high heat. Add the cauliflower and season with salt and pepper. Allow the cauliflower to cook undisturbed for 3-4 minutes. When the cauliflower has seared and browned on the first side, stir the cauliflower and add the remaining tablespoon of olive oil and the olives. Cook for an additional 3-4 minutes until seared on all sides. Transfer the cauliflower and the olives to a platter and top with salsa verde. Rinse, dry, and stem the flat leaf parsley, mint, tarragon, and fennel fronds. Finely chop the herbs with a sharp knife taking care not to bruise them and place in a small bowl. Rinse, dry, and finely chop the chives and add to the bowl with the herbs. Add the onion, capers, red chili flakes, lemon zest, lemon juice, and olive oil to the bowl and stir to combine. Season to taste with salt and pepper. Serve at room temperature. 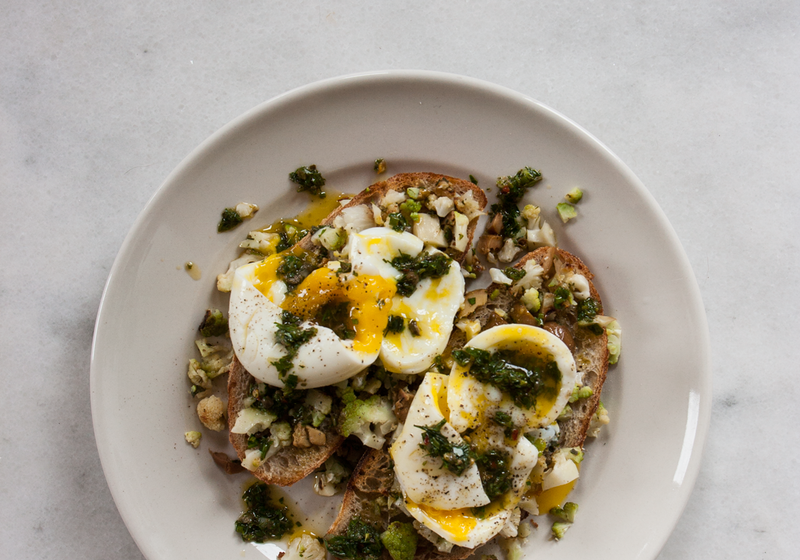 The next morning, I finely chopped the extra seared cauliflower with salsa verde and olives from the night before and served it on toast with soft boiled eggs for breakfast. In March, my husband and I spent two days in Charleston, South Carolina. We explored the streets of the Charleston Historic District where we admired the architecture, chatted with the friendly locals, and indulged in traditional Southern food and drink. The second night of our visit we dined at Sean Brock’s restaurant Husk. On the advice of a local shop owner, we arrived at the restaurant early in order to enjoy a bourbon from the extensive collection at Husk’s bar. While drinking our hand crafted bourbon cocktail, we tasted the delicious pimento cheese on the bar menu. Every southern cook has their favorite recipe for pimento cheese; my new favorite pimento cheese recipe is adapted from the cookbook Heritage by Sean Brock. Place the cream cheese and mayonnaise in a large bowl and stir until well combined. Add the hot sauce, salt, sugar, cayenne pepper, white pepper, smoked paprika and stir to mix. Add the chopped pickles, pickle brine, and grated cheese and stir once more. Gently mix in the chopped pimentos. The pimento cheese will keep for 2-3 days in the refrigerator. 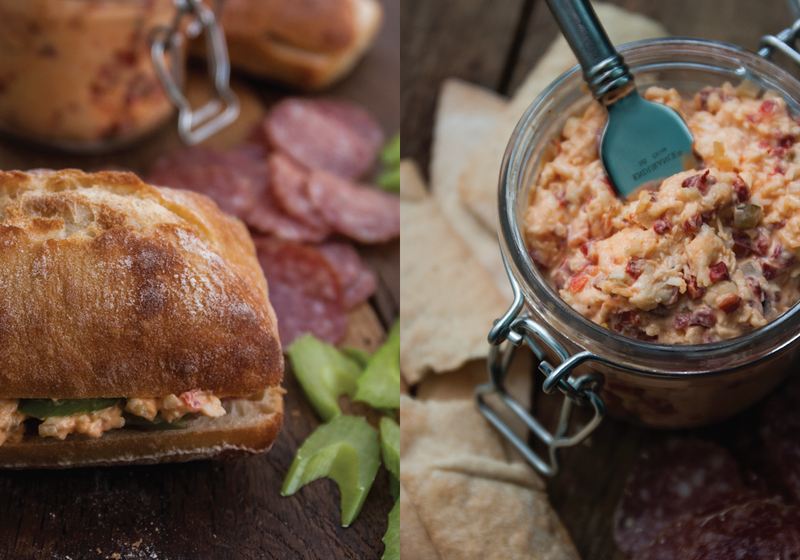 Serve the pimento cheese with salami and a selection of crackers. A sandwich of pimento cheese, salami, cornichon, and celery on artisan bread is also delicious. *I used Emeril’s Homemade Sweet and Spicy Pickles that I canned last summer when pickling cucumbers were abundant in the market. You can use your favorite bread and butter pickles. On a recent trip to Charlottesville, Virginia, I enjoyed a delicious dinner with family at Lampo Neapolitan Pizzeria. The restaurant features an authentic wood-fire brick oven imported from Naples where Neapolitan pizzas are prepared with the finest ingredients. In addition to pizzas, local and seasonal vegetables are wood-fire roasted to perfection in the oven. 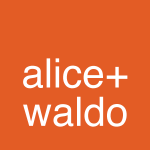 The night I dined at Lampo Neapolitan Pizza, there was a roasted carrot special on the menu. 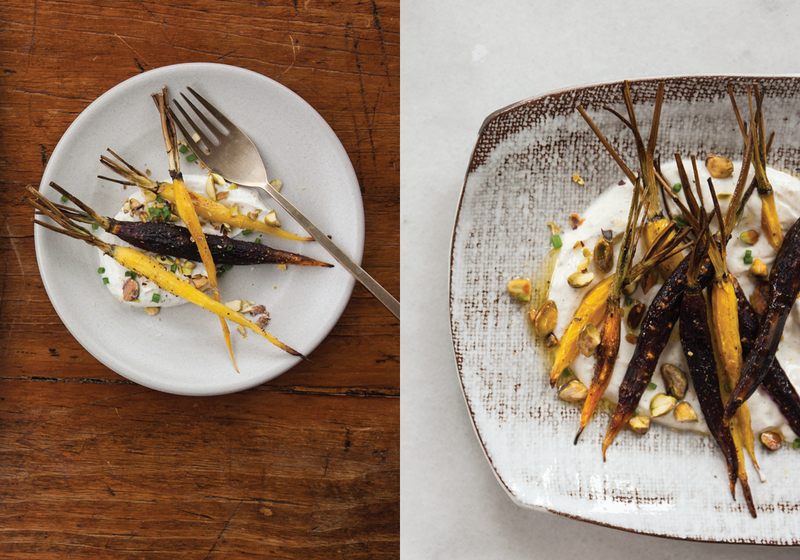 This recipe for Roasted Carrots with Sumac Yogurt Sauce and Pistachios was inspired by these flavorful carrots. 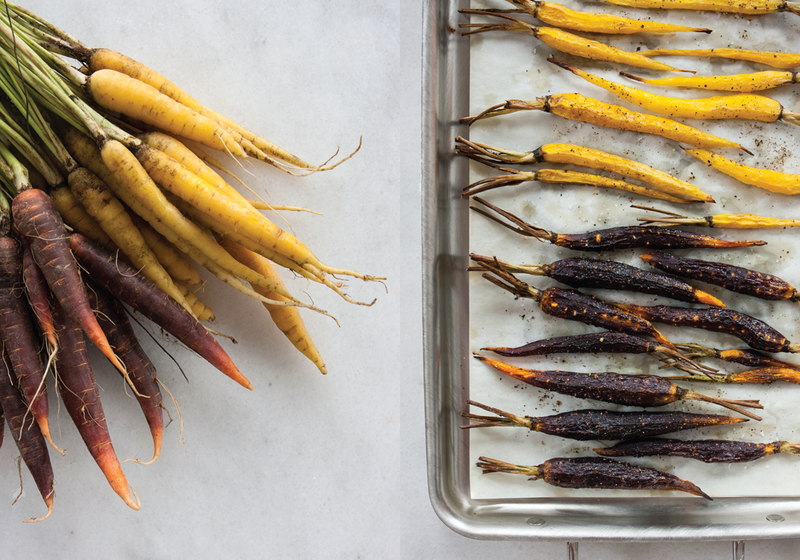 Toss the carrots with the olive oil. Place on a sheet pan lined with parchment paper and season with salt and pepper to taste. Roast in the oven for 20-25 minutes. While the carrots are roasting, place the pistachios in a small oven proof pan. During the last 5 minutes of cooking time, place the pistachios in the oven and toast until fragrant. Remove the carrots and pistachios from the oven. Roughly chop the pistachios and set aside. Spread the sumac yogurt sauce on the bottom of a platter. Place the roasted carrots on top of the sauce and sprinkle with the toasted pistachios and chives. Place yogurt, lemon zest, lemon juice, olive oil, sumac, salt and pepper in a small bowl and stir to combine.